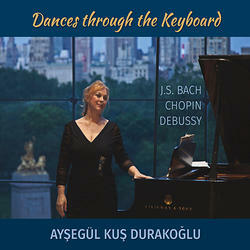 Exciting and expressive performances of popular dance forms by Bach, Chopin, and Debussy performed by pianist Aysegul Durakoglu. “I have always been fascinated by dancers and the music that accompanies their delicate motions. My earliest memories consist of my parents waltzing together, and of me dancing with my father. After losing my Dad last year, these memories grew more vivid, and I have decided to bring them to life through this compilation dedicated to his memory. Thank you for taking time to share this experience and the richness of the dance forms used by the Classical composers through the centuries. Beginning from the Renaissance to today, dance forms have become musical art forms in the hands of composers like J.S. Bach, Chopin, and Debussy. I hope these selections serve to evoke many more memories within others and create new ones. Please enjoy."